“As a saxophone player and composer who has integrated electronics in my music for many years, I wanted to experiment with the reed quintet – typically a classical chamber music format – by opening it up with improvisation and electronics. I decided to launch a project spanning three cities where I’ve made long-lasting musical connections: Amsterdam, Chicago, and Oakland. While living in Oakland in the summer of 2013, I approached Philip, Jon, Kyle, and Frank (on a residency from Berlin); all veteran improvising reed players with experience with electronics. With the spirit of the experimental music scene there in mind, I wrote a set of short compositions that connect the textural possibilities of our reed instruments and our electronics. The electronics include my Lyricon (which counts as an analog electronic reed instrument) and John and Kyle’s interesting collections of analog synths and noisemaking modules. 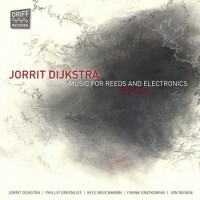 Music for Reeds and Electronics: Oakland is the first documentation of this project; it ended up as a curious assemblage at the intersection of electronic music, noise, free jazz, and modern chamber music.” Jorrit Dijkstra June 2014.